Sara May first picked up the acoustic guitar at age 12, but her passion for music and songwriting didn’t start until four years later. 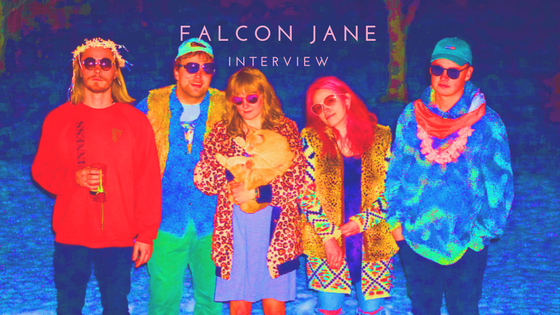 Her musical project, Falcon Jane, started as a solo project before finding her current lineup - Andrew McArthur, Branson Giles, Racquel Hardy and Aiden O'Brien. And those four bandmates are her biggest influence. “You could say the current line up came together through a series of ‘divine appointments’ - we met each other by chance, but we’re all so like-minded and love each other so much that I think we would have ended up finding each other eventually,” she said. Every day she is inspired by her friends and bandmates, who she says create gorgeous, dynamic music that’s hard not to be inspired by. Although the project started as making a record in her bedroom, the inspirations of nature, truth, peace and magic are what drive them to constantly reinvent themselves. May can’t think straight, let alone create, if she’s not close to nature. The ability to be able to walk outside and get lost in the sounds of the world makes up a significant amount of her songwriting. Songwriting is a way for her to explore and express her personal truth and she believes that sharing her truths give others the opportunity to explore their own. She isn’t afraid to admit certain emotions or believe in certain ideas and she certainly isn’t afraid to share them with anyone that will listen. Finding peace, emotionally and physically, is her ultimate goal. Peace is the constant driving force in her songwriting, and she firmly believes that achieving peace plays a major part in her songwriting. Magic is everything else that can’t be explained. Whether it is trusting God or the universe or whatever it may be, it’s something that she struggles with but embraces. With these four inspirations, she’s gone from making am album by herself in her bedroom to borrowing microphones to use at her drummer’s house to recording in a bona fide studio with numerous microphones and talented engineers. Her third album, Feelin’ Freaky, is being released this summer and “Go with the Flow” is the first single. It’s her personal favorite on the album and combines the nature, truth, peace and magic that inspires her so much. She hopes it’s your favorite, too.